When it comes to selling, marketers and salespeople seem to have the subtle, yet overwhelming, desire to put the proverbial cart before the horse. It’s easy enough to see why: The sale is the goal. It is the macro-yes we are all searching for. If a lead is generated but fails to close, it’s good for nothing but taking up space in the email database. It is the same with marketing. Some “match made in heaven” leads are ready to close right away, but most leads require some nurturing before coming to a buying decision. What is the most effective way to nurture leads? Are there concrete principles we can rely on to improve our nurturing processes? These are questions that need answers. Experiment: Which voice email script will generate the most responses? Our Research Partner for this experiment is a well-known insurance provider. One aspect of its sales process is connecting with businesses over the phone to see if it can become the provider of the business’ employee coverage. When a phone call is not answered, the phone representatives use a voicemail script to ensure the company consistently puts itself in a position to have the call returned. The company wanted us to test its voicemail script against a different script to see if we could produce a lift in callbacks. Those making the calls clearly favored the control, because they believed it produced the best response. Hello, ___, my name is Lisa and I am calling with [insurance company]. We are currently the fifth-largest life insurance carrier in the nation offering competitive rates and solutions to help ease administration burdens. When we last spoke, you told me that you work with a broker for your price quotes for the group life benefits. I would like to get your broker contact information in order to be in consideration when they next do their evaluations for you. Hello, ___, my name is Lisa and I am calling with [insurance company]. When we last spoke, you told me that you work with a broker for your price quotes for the group life benefits. Since we do not nationally advertise and may not have had the opportunity to work with your consultant, we would like to share our information with them. I would like to get your broker contact information in order to be in consideration when they next do their evaluations for you. As you can see, the changes in the script are not massive. In most cases, we simply juggled the order of the sentences. Did these changes have an impact? Yes, the treatment script produced a 31% increase in callbacks. What was it about the treatment script that nurtured the lead more effectively than the control script? We have arrived at two lead nurturing key principles that should help clarify the situation. Key Principle #1. Lead nurturing is a process, not an event. The necessary timing allows for the necessary forming — the forming of the final conclusion. 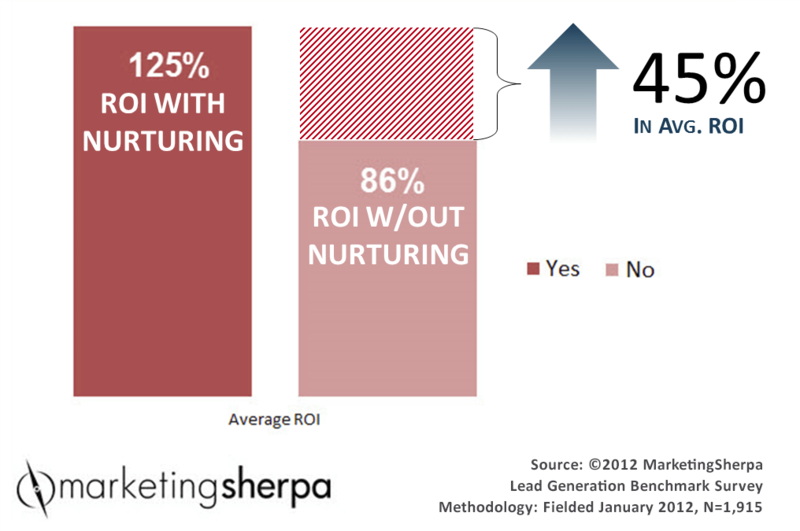 Only 36% of marketers nurture leads, according to a 2012 MarketingSherpa survey. 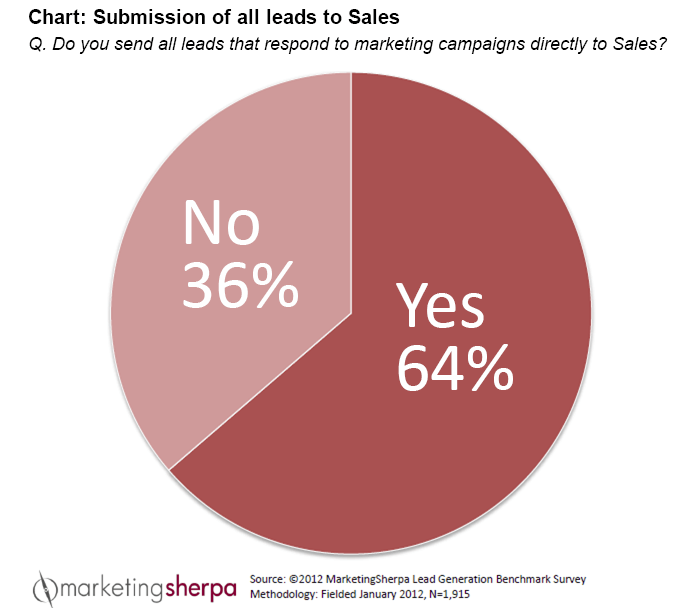 That means when 64% of companies acquire a lead, they send it straight to Sales. If that’s what you are doing, you are treating lead nurturing as an event that, once completed, qualifies the lead for closing. This is not how lead nurturing works. It is a process that builds upon itself, always moving the lead toward fostering a conclusion about your product: I need to buy this product. Why does lead nurturing matter? Is it really a big deal if we do not nurture leads? Figure 1.2 explains that, yes, it is a big deal. You may be sacrificing a potential 45% lift in overall return on investment if you fail to nurture leads. When we talk about a “macro-yes,” we are dealing with the ultimate goal of the sales process: the sale. This is when actual money is exchanged for your product or service. This is not the same event as the final conclusion. The final conclusion is “I want/need this product.” A great deal of distance still separates the conclusion and the actual sale. That is the job of the sales team. A marketer’s job is not done when a prospect hears about a product. Our job is not finished when a prospect shows interest in a product. It is not even done when they actively seek out more information about it. A marketer’s job is only done when prospects decide to buy the product. Marketers foster conclusions. Salespeople turn those conclusions into sales. If you follow MECLABS, you may be familiar with the imagery of the inverted funnel. 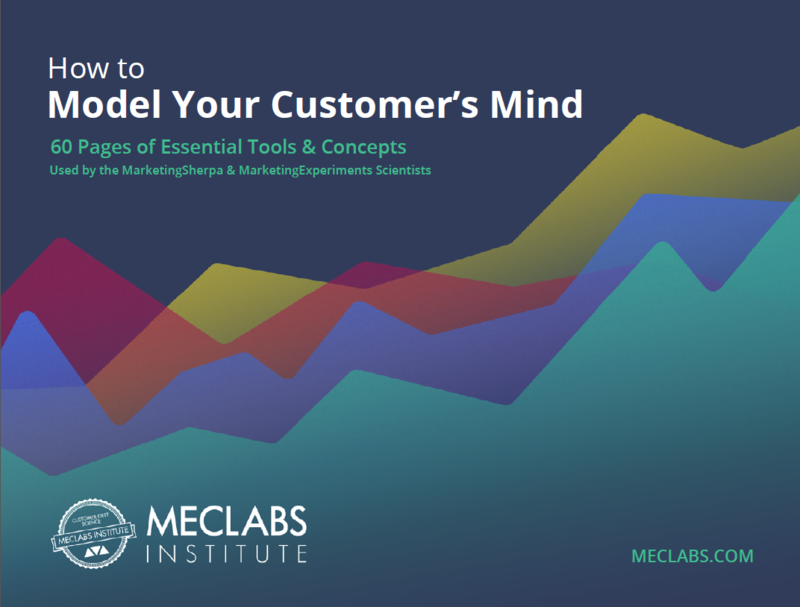 The idea is that the “funnel” is a misleading symbol for the sales process. Gravity is not your friend. If people “fall” anywhere, it is out of your funnel, not into it. 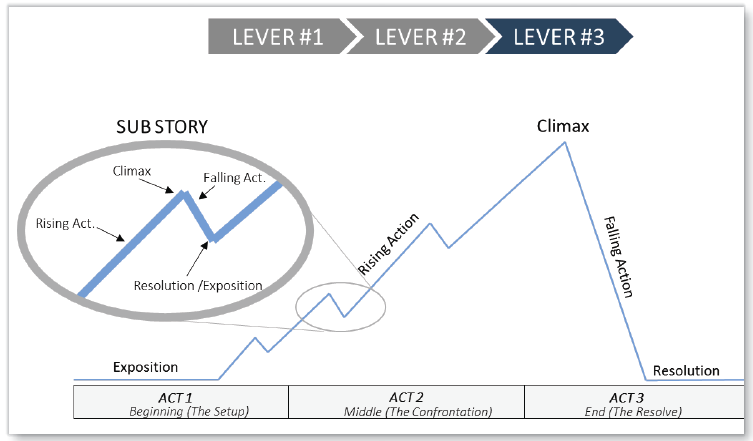 Reaching the macro-yes is more like climbing a mountain than slipping through a funnel. 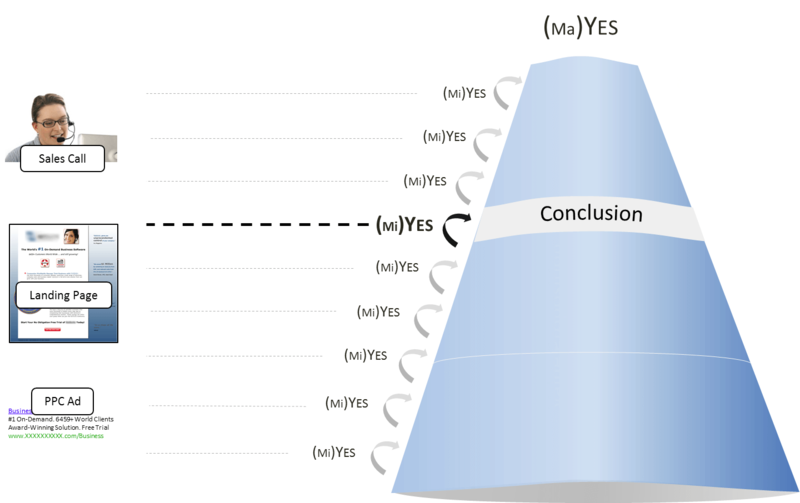 Figure 1.3 gives you an approximation of where the final conclusion in the process is and illustrates that many micro-yes(s) must be achieved to reach that goal. In the lead nurturing voicemail experiment, we pulled three specific levers to help the lead foster a conclusion. We use context to navigate the world. Context is how we know whether a joke is appropriate or if a friend needs our condolences. Without context, we cannot make sense of the world, and it is the same with marketing. The first script from the experiment begins selling right away without any context for the call, which may have caused listeners to tune out or delete the message before ever reaching the context buried toward the end of the script. We moved the context (“Last time we spoke …”) to the beginning of the treatment script, which helped produce the 31% lift. You’re just one step away from getting FREE access to [company], our award-winning Event Registration and Management Software. Quickly make an event website, try our event marketing tools, build a registration form template or even generate custom name badges. I noticed that you started the process of getting free access to [company] but weren’t able to finish. Are you concerned about giving out your phone number? Are you worried about high pressure sales tactics or mandatory contracts? We believe our product sells itself, so we’re just here to provide you with whatever assistance you need in getting your event up and running — in whatever way works best for you. We promise NEVER to sell or misuse your information. By providing the context for the email and adapting the tone to match that context, we produced a 349% increase in conversion. Prospect-level: If I am [PROSPECT A], why should I buy from you rather than any of your competitors? Product-level: If I am [PROSPECT A], why should I buy this product rather than any other product? 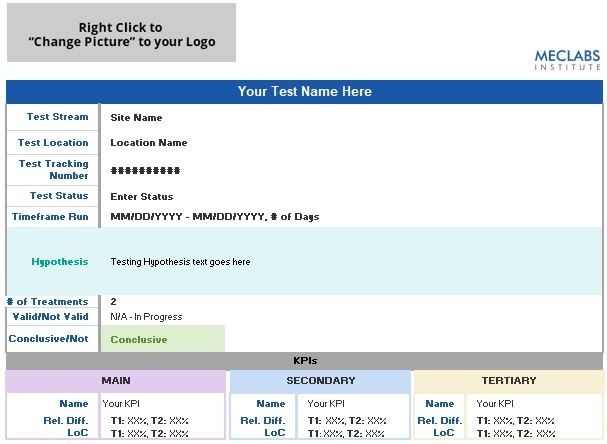 Process-level: If I am [PROSPECT A], why should I choose this PPC ad over any other PPC ad? In lead nurturing, it is crucial to connect your value proposition to the specific prospect. In the case of the voicemail experiment, that was the person answering the phone. Our research revealed these people had high anxiety when they felt they were being “sold,” and they also had no interest in learning about an insurance company. They simply wanted to pass us on to their insurance broker. When we made that action the main component of the voicemail, callbacks increased 31%. 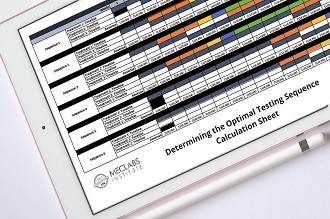 In Test Protocol 1483 located in the MECLABS Research Library, we worked with a physician-only social network to improve one of its landing pages. 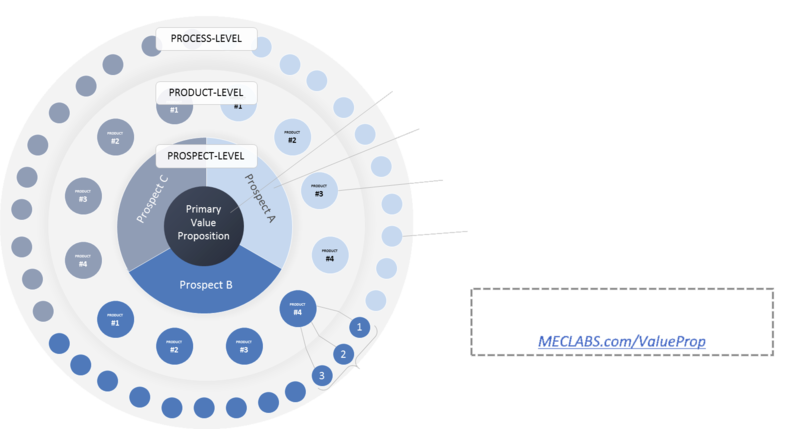 The control page focused on the product-level value proposition of a single report. When we redesigned the page to focus on the specific needs of the prospect we added in many other reports the prospect might be interested in reading. 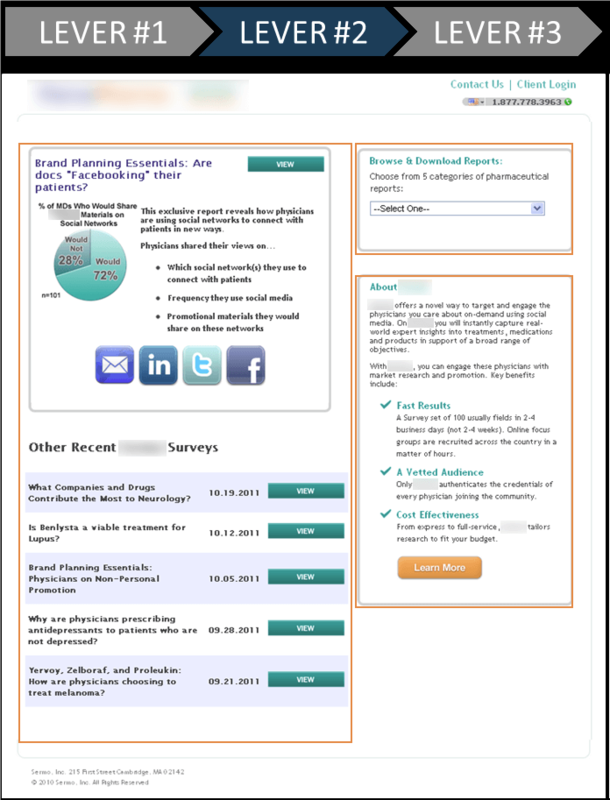 The result was a 197% increase in lead generation. People’s minds arrange arguments into the form of a story. If you present an argument that deviates from traditional story form, you will likely confuse or bore your prospect. This is exactly the pattern we followed with the treatment message which led to a 31% increase in callbacks. 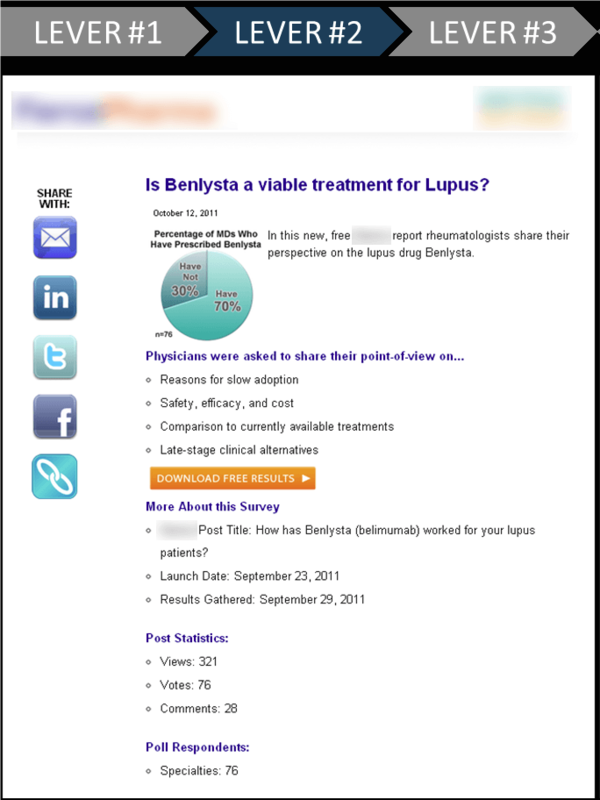 Similarly, in an email experiment for the same physician-only social media site mentioned previously, we noticed the control email seemed to be out of step with where it was actually positioned in the sales story. The email attempts to build value and get the prospect to click on a “Get Started” button. However, it conflates its objective with the objective of the landing page. The objective of the email is simply to get a click. 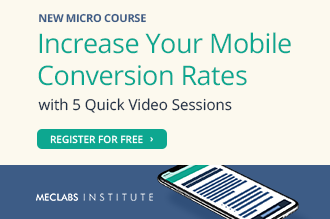 In our treatment, we dialed back the ambition of the email by simply providing value and a soft call-to-action to “See How [Product] Works.” The result of matching the email’s argument to the appropriate “ask” was a 104% increase in lead generation. We have established that 64% of companies do not engage in any lead nurturing to speak of. We also determined that those who do engage often rely on unsound principles that can be remedied with simple tweaks. To create lead nurturing materials that form a process, and are also optimized to foster a final conclusion, there are three levers you must pull. We have created this simple checklist to ensure your lead nurturing is on track. □ Is the message clear to your prospects? □ Have you justified the reason for the message? □ Is the message relevant to the prospect? □ Does the message appeal to your prospect? □ Is there a clear and logical argument in your material? □ Does the “ask” logically flow from your argument?